Winston Colt travels the late nineteenth century West delivering weapons for the Colt Firearms Co. custom gun shop. As expected, he's an expert marksman with both a pistol and a rifle, which he frequently demonstrates. As an occasional lawman, his swagger and brawn cuts an intimidating figure atop his massive white Andalusian stallion, appropriately named Big Thunder. When they arrive at a foothill town in the Rocky Mountains to deliver a cased set of Colts he meets an array of characters including a saucy ranch owner, Marilyn MOntgomery, who breeds Paints but mysteriously hides half her face with long red hair. She becomes the center of action as Winston is drawn into a conflict that takes him and Big Thunder up through the newly fallen Rocky Mountain snows to a hunting lodge full of cutthroats. 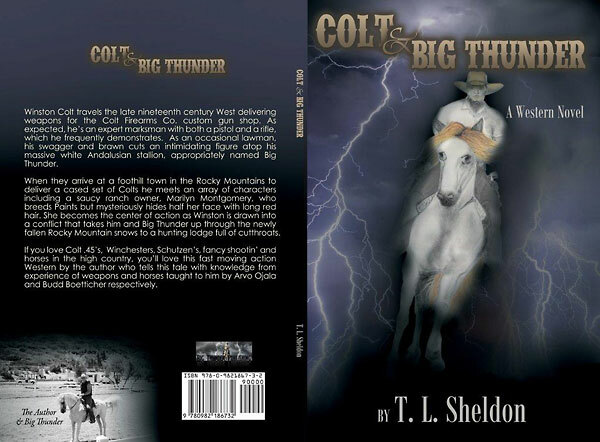 If you love Colt .45's, Winchesters, Schutzen's, fancy shootin' and horses in the high country, you'll love this moving action Western by the author who tells this tale with knowledge from experience of weapons and horses taught to him by Arvo Ojala and Budd Boetticher respectively.